Award-winning folk and blues musician Claude Hay is known around the world for the resourceful performance style that has made his music so unique. A solo artist at heart, Hay’s utilization of looping pedals and electronic drum kits enable him to personally control each instrument for the duration of every song he records in the studio – yet it is an even greater feat to exercise this self-sufficiency live. 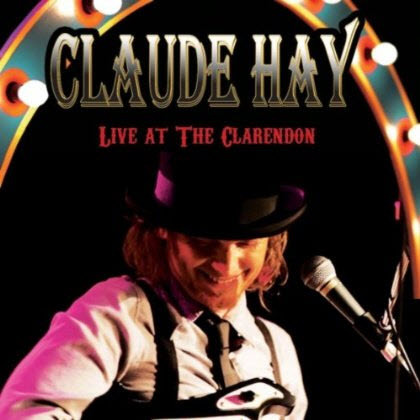 With the release of Hay’s latest project Live at the Clarendon earlier this spring (released simultaneously in DVD format), fans are given the chance to appreciate Hay’s work onstage as the sole executor of 12 live tracks. Recorded in Hay’s Australian hometown Katoomba, Live at the Clarendon features an assortment of tracks taken from his 2010 Billboard Blues Chart climber Deep Fried Satisfied and I Love Hate You, his 2012 studio album. While most of the songs on Live are Hay originals, a couple covers of note sneak their way onto the record. The album’s introduction (simply titled “Intro”) offers a nod to the Beatles as a recitation of a famous John Lennon quote from 1963 encourages Hay’s audience to “rattle [their] jewelry.” On track 12 of Live, Hay brings his Beatles tribute full circle with a performance of “Come Together,” taken from I Love Hate You and spiced up for his Clarendon audience. Hay similarly samples Queen’s “We Will Rock You” on Live, giving the legendary anthem a guitar-tinged twist with layers of burning riffs. Hay’s predilection for riffing and scaling is one of the first things that jumps out on Live. His trend towards heavier guitar work began on I Love Hate You; evidently, it’s a technique Hay still finds fruitful, and his audience seems to wholeheartedly agree. Buttressing each number are Hay’s fans, clapping and cheering on his efforts as he trades his slide guitar on “Stone Face” for the acute fingerpicking of “207.” None of the songs on Live are happy-go-lucky numbers: they all require an elevated degree of technical prowess and substantial musicianship. Going it alone is proof of Hay’s unfettered ability to meet the demands of a solo act onstage, conversing with his audience during the brief breaks between songs and displaying his skills for all to see and hear during his playing time. The release of Live was an important step for Hay – the open setting enables him to show all that he is capable of with just his instruments by his side. From old fan favorites “207” and “Get Me Some” to the solid Beatles cover, Hay’s live album does his reputation as a top-notch solo performer justice.